I have the good fortune to walk Meera to her pre-school every morning. We walk by our neighborhood and cross a park on her way to school. It’s Meera’s field trip (picnic) everyday, and I am her lucky guide. Along the way we pass a house with colorful phlox bounding over the low garden wall. 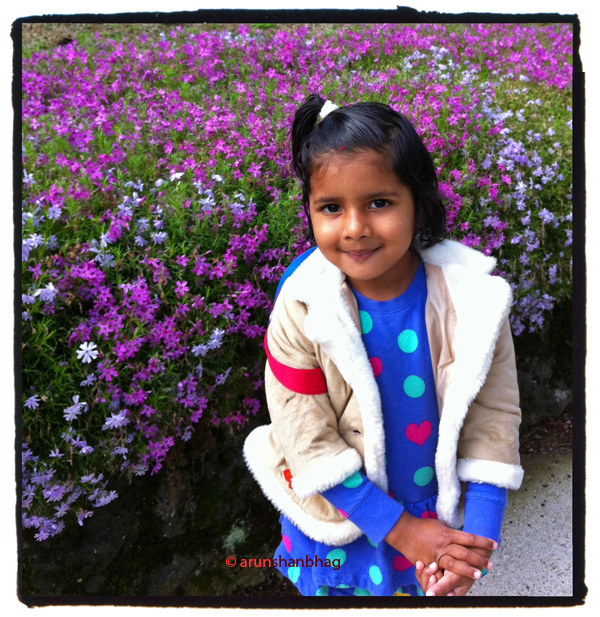 After a few days of taking pics in front of the blooms, now Meera runs on ahead and poses in front of the phlox. The above pic was on Tuesday when the rains held off graciously. Sorry for the blown highlights on her cheeks, a grating irritation of iPhone cameras. She brought her right index finger to her lips with a *shhh* and whispered, “Pappa, shhhhh, the flowers are sleeping.” Then brought her palms together, tilts her face and closes her eyes to denote “sleep.” Then points to her rain boots and takes small steps, implying we should walk softly. I paused and breathed in this moment, to etch this ecstasy for all posterity. So years later when I may not understand her teenage mind, I can find solace in this moment, … and cherish it then. Coz its the same little girl who so wows me now. See update on Meera and Spiderman. Life is indeed beautiful and I count my blessings every day! First of all Belated birthday wishes …Wishing you loads of happiness peace and success…there was some renovation work going on so i had no access to the internet…. sorry ok. I know this must have been one of your BEST birthday’s having meera and m with you, so what better gift one would want? Now about meera i know you are lucky to have a daughter as smart and chirpy and intelligent like her…but arun i feel she is even more luckier to have such a doting father who praises every action of her… Just the way u write about her you talk about her says it all. God bless you all with lots and lots of moments like these forever and ever. For some things there is no substitute and the feeling what parents feel about their kids….no words. Beautiful moments! There is a Tamil movie called “Abhiyum Naanum”(Meaning me and Abhi). It is about a father-daughter relationship. Your post reminds me of that film, which has scenes similar to what you describe – everything from the eyes of a father. Yes, with Meera I will have enough material for a movie and a few sequels. Every morning, I practice my patience as she asks a hundred questions. But I get to see this world anew. What joy! Lovely! Wish they would be this innocent forever and not grow up at all! Heh heh ~ Meera and I have long chats and I feel like I am speaking to someone much older. She always stumps me. Hope your kids are doing well. Ha ha! Don’t know about the spelling bee. She writes her name with 1 “e” and 2 “r”s. Grrr! But, teachers in preschool are impressed that she can write her name on a whim. A thing of beauty is a joy forever. I had the same feeling when I read this post. Thanks for the article on Meera. The background is beautiful but the words of Meera ” Papa Shhhhh, the flowers are sleeping ” reminds the childhood days of my children who are grown up now . … its amazing how fast they are growing. Gosh! How sweet and beautiful her mind is. Thank you for sharing your moment with her with us. Thank you for reading and connecting with Meera.